About the Book: Mallory doesn't remember the details of the evening but she knows that Brian is dead and she's responsible. But Mallory knows it was self-defense. She can still feel Brian's presence around her-or can she? Is it all in her head? In order to start over and get away, her parents send her off to the boarding school her father attended. But Mallory's secrets follow her-and she can't escape the past. 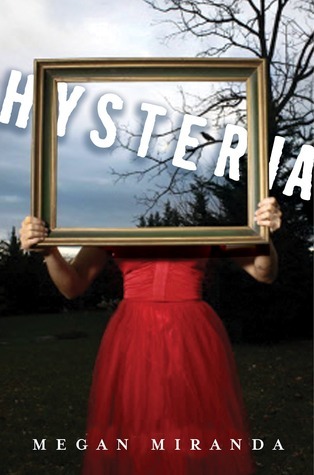 GreenBeanTeenQueen Says: The premise for Hysteria is what made me interested in the novel. Mallory dealing with a difficult situation in the past and learning how to overcome it and move on is what makes the book work. Unfortunately, the rest of story fell a bit flat for me. The writing is well done and the times the suspense is built up kept me engaged as a reader. But I found the flashes that Mallory gets as her memory is trying to come back too distracting. I loved and appreciated the way the author worked them in so that they didn't come in order and didn't always make sense. It was a great literary device and made the reader feel as though they were experiencing what Mallory was experiencing. Yet it just didn't work for me and I'm not sure why. I think instead it made me more distanced from Mallory than connected and caring about her story. Mallory wasn't sure who she was so at times I wasn't sure who Mallory was and it made me disconnected as a reader. I was also a bit distracted by how many boys I was supposed to keep track of. Brian, was Mallory's sort of boyfriend, Dylan, his brother and Mallory's original crush, and Reid, the boy Mallory knew from her past and is her new crush at school, and Jason, the school bad boy that maybe is hitting on Mallory. It was just too distracting having so many love interests. The plot was pretty slow moving as well. If you read the actual synopsis on Goodreads, it spoils something that happens very late in the plot. I knew that going in and it took much to long to actually get there, which made the plot drag. The pacing of the book didn't work to always build suspense. There would be a nice run of mysterious happenings and then it would sizzle out and drag for awhile. Mallory has a best friend character that was pretty cool and I liked her a lot, but I felt their relationship wasn't as developed as well as it could have been. Her friendship with Colleen and her possible romance with Reid were what kept me reading and finish the book, but they weren't the most engaging either. There was just too much happening in the plot and the ultimate mystery happening at the school ended up feeling underdeveloped and rushed when it was all figured out. I even felt that the truth about the night with Brian was a let down after all the build up and expected a bit more. The two storylines just never seemed to work well together and at times it felt like I was reading two different books and I wondered how everything fit together. I think there are readers who will enjoy this book and like the mystery aspects of the plot. It was a great premise and there were some great moments with the characters. Ultimately, it just wasn't the right book for me. I thought Colleen was absolutely amazing and the ending part around their friendship was a real standout. However I agree with your criticisms about pacing and wish this book had flowed a bit better. I loved their friendship and really liked that aspect of the book. I think that was the strongest plot throughout.